This week we headed off to Llanelli to visit Parc Howard Museum and Art Gallery. Our regular thirteenfridays guest, Sam Knight, is a fantastic woodworker and he has a beautiful handmade chair in a curated exhibition Pair //Pâr showing in the museum until July. Serendipitously, Parc Howard is also said to be haunted by a number of ghosts. So we popped in to the exhibition keeping our eyes and ears open at the same time for any uncanny fellow visitors. The building was used as military hospital in both world wars and it is said that the ghosts of a nurse and a soldier are seen together on the main stairs. There has also been scratching and scraping noises at the back of the building which is said to be the ghost of a young man; a lover who hid in the chimneys of the house to avoid detection but who became disoriented and trapped, subsequently losing his life in the narrow network of passageways. Lady Howard herself is also said to wander in the house seen as a ghostly white lady and sometimes appearing at the windows. Lights have also been recorded at night in the empty house after the building has been locked by staff. 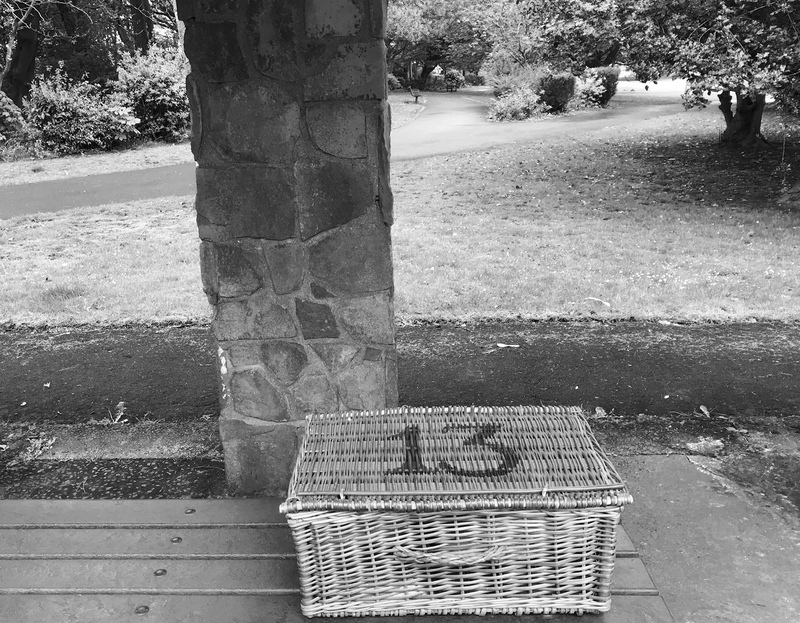 We unpacked our 13 themed picnic in the grounds of the house. 13 Crustless mini quiches flavoured with a selection of 13 ingredients (Spinach, Rocket, Asparagus, Red Chilli, Green Olives, Tomato, Cheddar, Parmesan, Basil, Oregano, Sundried Tomatoes, Spring Onion, Black Pepper) served with 13 slices of cucumber; 13 ingredient smoked chilli salsa (Red onion, Garlic, Green chili, Chipotle chili, Sun dried tomatoes, Red pepper, Lime Juice, Tomatoes, Smoked paprika, Salt, Thyme, Parsley, Sugar) served with tortilla chips; 13 ingredient vegan slaw (White cabbage, Red cabbage, Carrot, Fennel, Celery, Olive oil, Sunflower seeds, Pumpkin seeds, Green Olives, Parsley, Lemon juice, Salt, Pepper); special 13 ingredient Bara Menyn sourdough loaf; 13 baby plum tomatoes on the vine; 13 ingredient ginger and walnut loaf with dates and figs (Flour, Baking Powder, Brown Sugar, Ground Ginger, Nutmeg, Cinnamon, Golden Syrup, Butter, Eggs, Milk, Dates, Walnuts, Dried Figs).